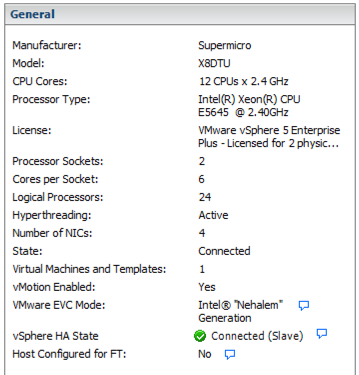 Take the following system, a Supermicro VMware ESXi host with Intel Westmere E5645 CPUs. Part of our deployment process is to set the appropriate Enhanced vMotion Capability (EVC) level for the vSphere cluster to avoid problems during possible future expansion. The Intel E5645 CPU is a mid-range Westmere CPU. 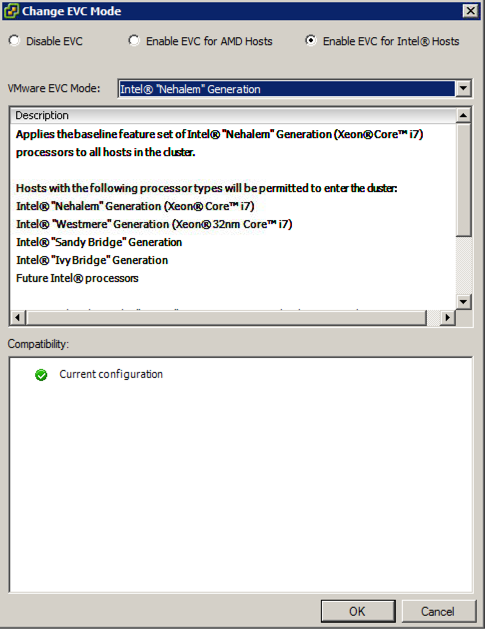 However, VMware does not allow us to set EVC for this CPU model. It does work if we drop one level to the "Nehalem" mode. 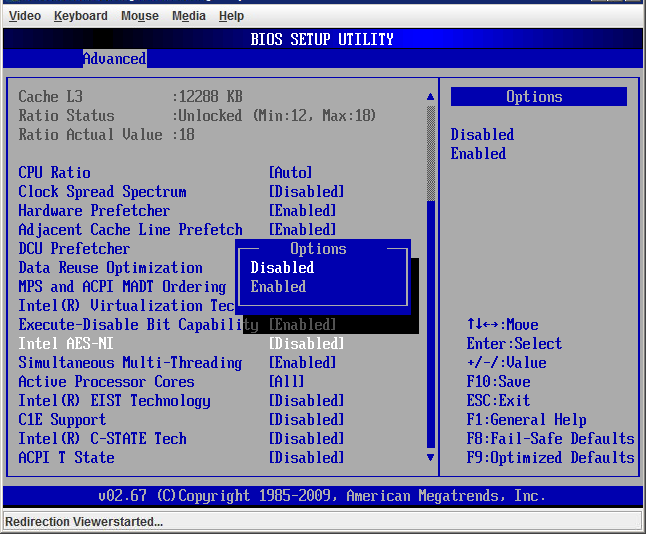 The Intel AES-NI feature was disabled in the BIOS on the host servers. 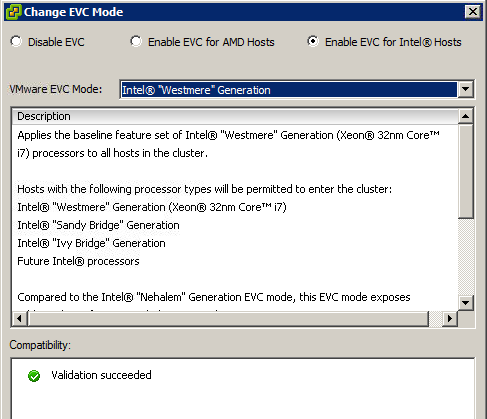 Enabling it allowed me to use the Westmere EVC level. Looks like VMware KB 1034926 specifically covers this. 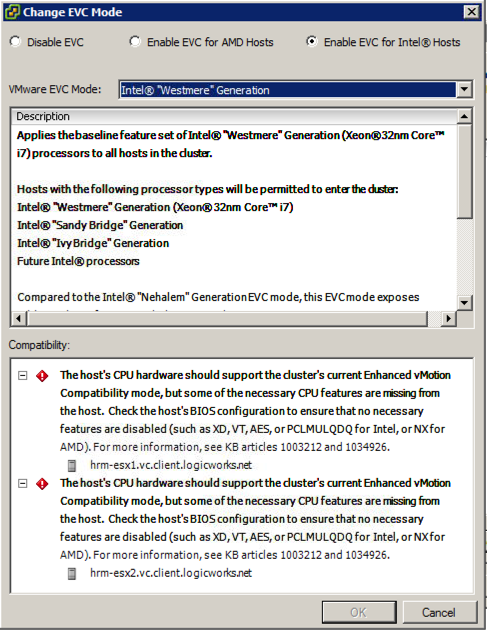 some Westmere micro-architecture processors that have AES/PCLMULQDQ features disabled are not permitted into Intel Westmere (Xeon 32nm Core i7) EVC clusters. If these features cannot be enabled in the BIOS, the host will only be admitted to the Intel Nehalem Generation mode or below. Hopefully the Supermicros have a way to enable these features? If not, you're stuck in Nehalem mode. Not the answer you're looking for? Browse other questions tagged vmware-esxi hardware vmware-vsphere intel or ask your own question. Enforce EVC for specific VM on vSphere 6?